The trees of Concordia University have stories. Those stories are about how Frank W.J. Sylwester – president of Concordia University from 1905 to 1946 – acquired an eclectic inventory of trees for the campus. The grand Oregon White Oak (Quercus garryana) is the sentry on Luther Hall Green. That oak was about eight years old when the college, then high school, opened its doors. It was one of the original trees in the Douglas fir woods of east Portland. Frank was passionate about trees. 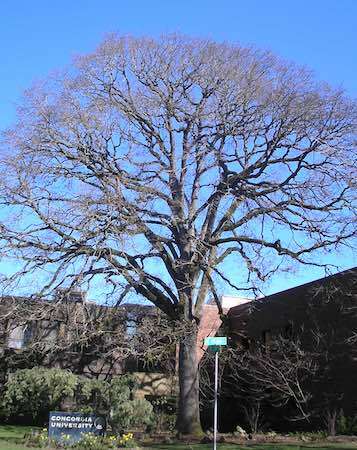 When the right of way for 28th Avenue posed a threat to the oak, he advocated for the tree to be spared. He satisfied his yearning for connection to his Germanic ancestry by planting trees germane to Germany. In 1908 he planted European Linden (Tilia × europaea) seedlings from Berlin. He purchased and planted a Spruce (Picea) from Germany. A Correl Tree (Oxydendrum arboreum) is a gift to the campus from Sylwester. In 1960, he saved a small Sequoia (Sequoiadendron) at a campus building construction site. He replanted it in a stand of Incense Cedars (Liborcedrus decurrens). In 1964 he traveled to central Oregon and brought back a Western Juniper (Juniperus occidentalis) seedling for the campus. In the beginning, the president’s home was part of the campus, just north of Elizabeth Hall. He surrounded it with trees from his travels – Redleaf maples (Acer Palmatum) and Common Hawthorn (Crataegus monogyna) to name two. He had an inventory of 59 trees sorted by common and scientific name divided into five, creating the Campus Tree Project. That project was published in 1974, “Arbor Vitae,” with anecdotal tales and tidbits of Concordia University history. Karen is a retired early childhood community educator, health and safety trainer.